The A012 Puttalam to Anuradhapura is at the west end of the A012 in Sri Lanka's North Western Province and to the south of the Wilpattu National Park. There is ample RoW to allow improvement for most of it’s length. However, in the Puttalam area, west of km2 the road passes over a railway level crossing and through the urban area, past three schools and through the market in the town centre. Southbound through traffic must then cross the railway again on the A3 on the way out of town. Access to the town centre from south or east requires vehicles to cross railway level crossings and through narrow streets, past temples, schools and through residential areas. Through traffic must also follow this main road route or "rat- run" through the residential outsdkirts of the towm, lined with many sensitibve receivers. Traffic conditions are already congested and many heavy busses and trucks already use a route through the outer urban area avoiding the railway crossings along a single track road to the west. To do nothing would exacerbate the deteriorating traffic and environmental impacts to unacceptable levels but road widening is a difficult option to pursue in Puttalam Town due to the busy urban conditions. Therefore bypass options for the town have been examined. 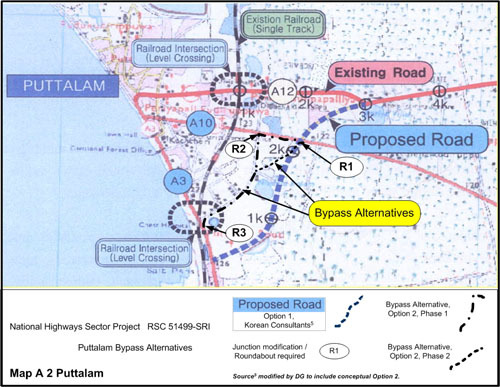 Bypass alternative routes for Puttalam town were also reviewed by David Green. Option 1 was proposed by the client along a single track road through the urban area but this option has not been favoured due to the narrow RoW which would require extensive land acquisition and resettlement. David Green independently examined another possibility (Option 2, R1 to R3 below) along another nearby single track road, which is also through the urban area but this option has a wider RoW and based on observation would require much less extensive land acquisition and resettlement. Observations also indicate that heavy vehicles already use this route to avoid the railway crossings and town centre. Option 2 has a fairly well defined alignment and could also offer options to be implemented in phases. No new roads would be needed in the first phase of Option 2 but three roundabouts would be required. 500m of new road could be developed to add value, as land is acquired in Phase 2, Option 2. Project: Asbestos Removal, Kowloon Cricket Club, Asbestos Management. Project: Ting Kau Bridge, Environmental Management. Client: Highways Department (Hong Kong Government). Project: KCRC East Rail Lok Ma Chau Station, Environmental Management. Client: Balfour Beatty Lam Joint Venture (Lam Environmental Services).